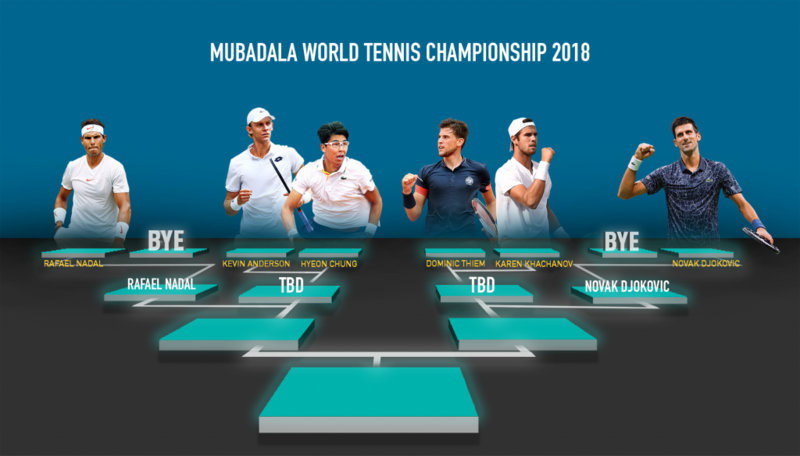 With just under a month to go until the start of Mubadala World Tennis Championship (MWTC), organisers FLASH Entertainment have revealed a thrilling draw for the tournament. Fans attending the event at Zayed Sports City in Abu Dhabi between 27th – 29th December are set for three days of high-intensity tennis between some of the world’s top players. The first of two matches on day one will be between defending champion and 2018 Wimbledon finalist Kevin Anderson and Australian Open semi-finalist Hyeon Chung. The young South Korean will be out to make his mark and overcome the imposing South African, who has beaten him in both of their previous encounters. This will be Anderson’s third appearance in the UAE capital, while Chung will be making his debut after a successful year which saw him win 29 out of 47 matches. The winner of this contest will take on world No. 2 Rafael Nadal in the semi-finals on day two. The day’s second match will see world No. 8 Dominic Thiem take on Karen Khachanov of Russia for a place in the last-four against world No. 1 Novak Djokovic. Khachanov, 22, has just enjoyed the best season of his young career, registering 46 wins, whilst Thiem will be bidding to improve on his performance this year after reaching his first Grand Slam final at Roland Garros. World No. 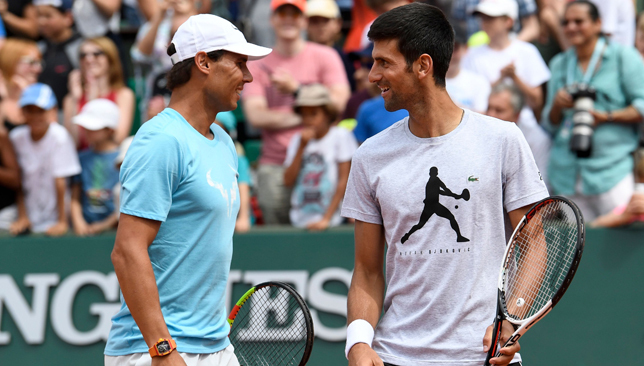 1 and 14-time Grand Slam champion Djokovic and 17-time major winner Nadal both received byes until the semi-finals, where they will face off against the winners from day one. With four of the six male players featuring in the top-10, this year’s line-up is amongst the best ever. Tickets for the 11th Edition of the MWTC are priced from Dh100 and can be purchased from www.ticketmaster.ae and all Virgin megastores across the UAE. Kids aged between 2 to 12 years can enter for free on day one of the Championship, along with the purchase of one adult ticket. The men’s tennis season finally concluded on Sunday as Croatia broke French home hearts to lift the Davis Cup trophy in Lille. 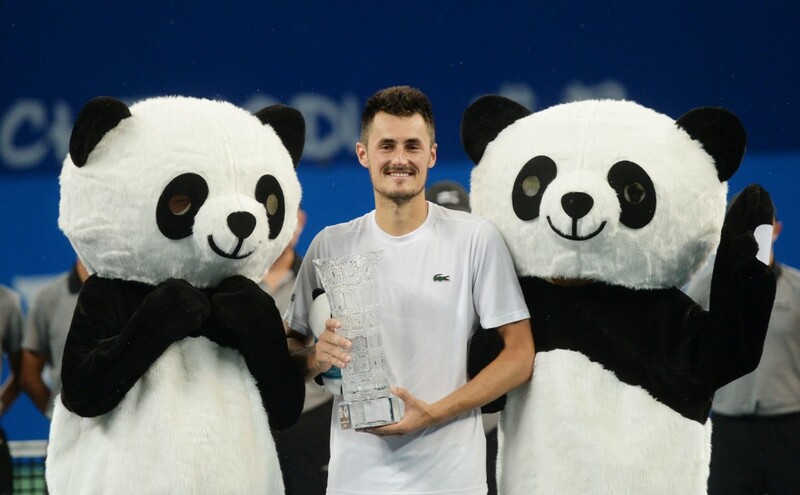 Players – and fans alike – barely have five weeks to reflect on the year that passed and prepare for the new season, which means I just have enough time to hand out some 2018 alternative awards for the men of the ATP circuit. These awards are not based on numbers, victories, losses and the like. They are a nod to some standout behaviour, encounters, anecdotes and experiences I’ve come across during my year of traveling the tennis tour. I spend a significant amount of time during the season watching players practice, which I sometimes find more captivating than an actual match. One of the most enjoyable practice sessions I’ve watched this season featured Canadian teen Denis Shapovalov. The young lefty was sharing a court in Rome with Jelena Ostapenko but that didn’t stop him from swinging from side to side along the baseline, hitting jumping forehands and backhands on every single shot. ‘Air Shapo’ is entertainment gold! Murray stepping away from Twitter and embracing Instagram is the plot twist we never knew we needed this season. The Scot’s posts have been nothing short of legendary. Whether he’s drawing attention to gun violence issues in America, posting childhood photos of himself accompanied by emotional messages about his injury struggles, bantering with other players in the comments, sharing videos of his impressively acrobatic workouts, and his most recent contribution: A photo of himself on the beach standing next to an inflatable ice cream lilo. Murray on Instagram could be a show on Netflix. Whether he is defeating Roger Federer and is ranked inside the top-10, or is clinging onto the top-300 and asking for qualifying wildcards at Challengers, Gulbis is always an intriguing character to talk to. He’s not afraid to ruffle a few feathers, can delve into deep topics on demand, and generally has strong opinions he’s always willing to share. This year, as a new dad, Gulbis has been playing with a purpose and has made his way back into the top-100. His improved results meant that he made quite a few appearances in the press conference room, and as always, he did not disappoint. In Dubai, he advocated for the lower-ranked players on tour, and how “the amount of people feeling safe and secure about their future in tennis is too little”. In Paris, he hit out at tournament organisers for testing the shot clock only in qualifying. “I like when they have the same rules for qualifying and main draw. I don’t like it when they try to test something on the weaker players. I don’t mind any of these rules, I just don’t like it when somehow qualifiers or somehow the weaker tournaments are being pushed less, it’s a hard enough life for them,” he explained. At Wimbledon, he sheepishly made fun of himself when he went to the wrong bench during his opening round against Jay Clarke. “I tried to joke, you know this panic joke, when you’re nervous and you don’t know what to do but then you panic? And then I tried to joke but something came out probably very stupid. Not funny at all… I was completely out of it. I lost the break and I was completely out. I was nervous,” confessed the Latvian. In a more philosophical tone this is how Gulbis explains the motivation behind his current pursuit of a tennis career. People often say that such is Djokovic’s popularity back home in Serbia, that if he ran for president today, he would win. Well if he ever decided to get into politics or foreign affairs, judging from his press conferences alone, it seems Djokovic would highly excel in the field. The world No. 1 has a smooth skill of giving long, analytical answers to difficult questions without really giving much away or rocking the boat. When you’re listening to him speak, you’re often impressed and inspired. When you start transcribing his quotes, you sometimes realise how cleverly he sidestepped a core issue, or a controversial topic. Considering how much press he has to do throughout the year, this is definitely a handy skill to have! The ATP Finals champion is only 21, but when it comes to press conferences, Zverev sometimes makes it seem like he is a 20-year veteran of the tour, who has been facing the same questions from the media for decades and has had enough of it. Granted, repetitive questions can get boring, but unfortunately for the German, it comes with the job. The world No. 4 has a tendency of responding to questions by first noting that he’s already answered them “150 times before”. He doesn’t like it and isn’t afraid of showing it. There have been exceptions this year of course. At Roland Garros, he found the accent of a reporter from Yorkshire particularly amusing and it kept him in a good mood. In Washington he was chatty and reportedly urged the media to ask him out-of-the-box personal questions. And in London this month, he pretty much answered the same question about being booed three times in the same press conference. Of course he was the one who pointed out that it was three times, but still, he answered. There is hope for us just yet! While he isn’t as acrobatic as Gael Monfils, who is always a candidate for best dancer on tour, Schwartzman has got moves and they made him one of the most ‘GIFable’ players these past couple of seasons. Scan the internet for his videos and you won’t regret it! 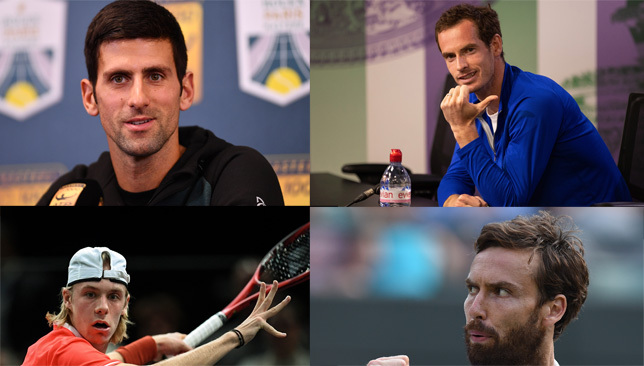 Top 10 the best ATP players for GIFs. The Aussie wasn’t always like this, but in 2018, Tomic was a man of few words. His peak moment probably came at Roland Garros where he said a total of 64 words in a press conference of 10 questions. When I asked him during Wimbledon qualifying why he wasn’t being too chatty with the media this year, Tomic smiled and said, “I’m always chatty, what are you talking about?” before walking away.